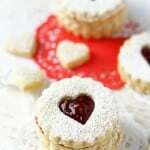 Home » Holiday Cookies » Gluten Free Linzer Cookies. 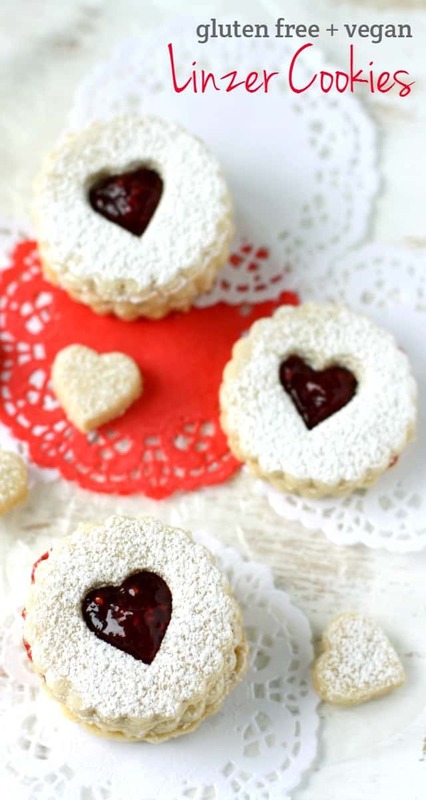 Vegan and gluten free Linzer cookies are a beautiful sweet treat for Christmas, Valentine’s Day, or any occasion. A dusting of powdered sugar makes these cookies look delicate and delicious. No matter what the holiday or special occasion, these sugar topped gluten free Linzer cookies are the perfect sweet treat. 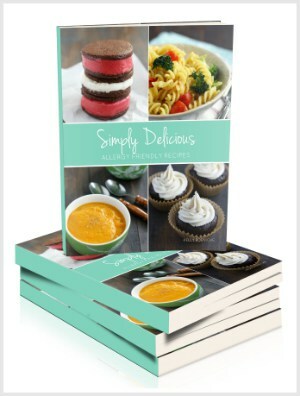 There’s nothing like an easy cookie recipe that not only looks pretty, tastes great, but also is free of the top allergens. 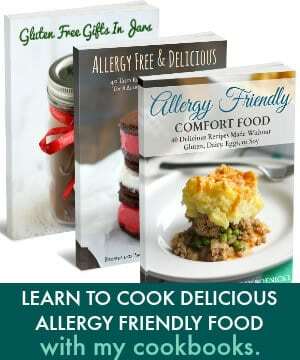 It’s always a nice surprise to find out that a recipe is not only delicious, but allergy friendly, too, right? These Linzer cookies check off all those boxes. I can’t think of a prettier cookie for your holiday cookie tray. 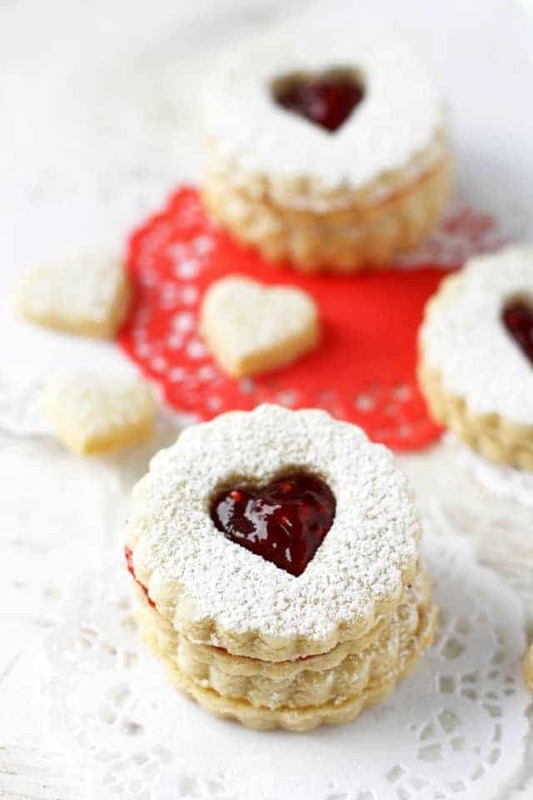 Linzer cookies are a version of the Linzer torte, from the city of Linz, Austria. 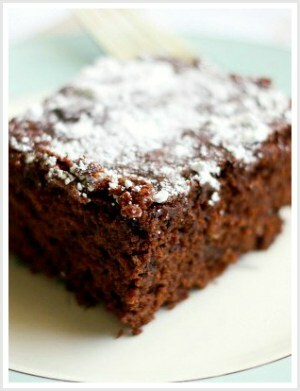 These are traditionally made with almond flour, but this version is nut free and allergy friendly. Will these cookies work with almond flour or coconut flour? I haven’t tried these with almond flour or coconut flour. If you try it, you may need more or less liquid. Be prepared to experiment! What kind of jam should go inside Linzer cookies? You can use any jam that you like! Red jams, like raspberry or cherry are festive for the holidays, but yellow or orange jams would also be nice! If you don’t like jam, try a chocolate spread or dairy free caramel. 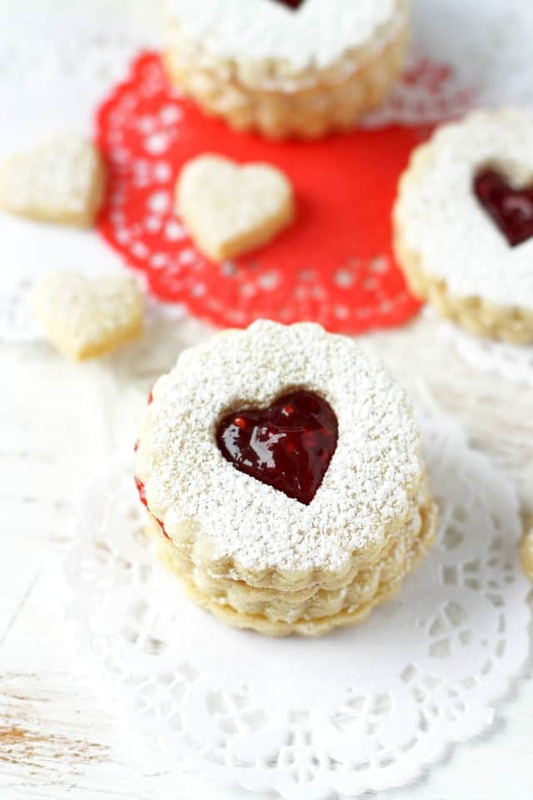 Vegan and gluten free linzer cookies are filled with jam and dusted with sugar for a beautiful and delicious treat! Place the vegan buttery spread and the sugar in a mixing bowl and beat on medium speed until light and fluffy. Add the unsweetened applesauce and mix until combined. Add the salt and the gluten free flour a half cup at a time and mix on low speed. The dough will be quite thick. Divide in half and pat into two discs. Wrap in plastic wrap and refrigerate for two hours. Unwrap one disc of dough and dust with gluten free flour. Dust the rolling pin and surface as well. Roll the dough to a 1/4 inch thickness. Use a linzer cookie cutter to cut out cookies, and then to cut out the shapes for the top layer. Bake at 350 degrees for about 10 minutes. Let cool fully. Repeat above steps with remaining dough. Dust the tops of the cutout layer with powdered sugar. Spread jam on the bottom halves of the cookies. Place the cutout cookie on top. Enjoy! You can make the cookie recipe ahead of time, and then just add the jam and powdered sugar when you wish. These cookies work well with Namaste Perfect Flour Blend, Now Foods Gluten Free Flour, King Arthur Flour, or my gluten free flour mix. Store leftover cookies in an airtight container. They should stay fresh for up to three days. 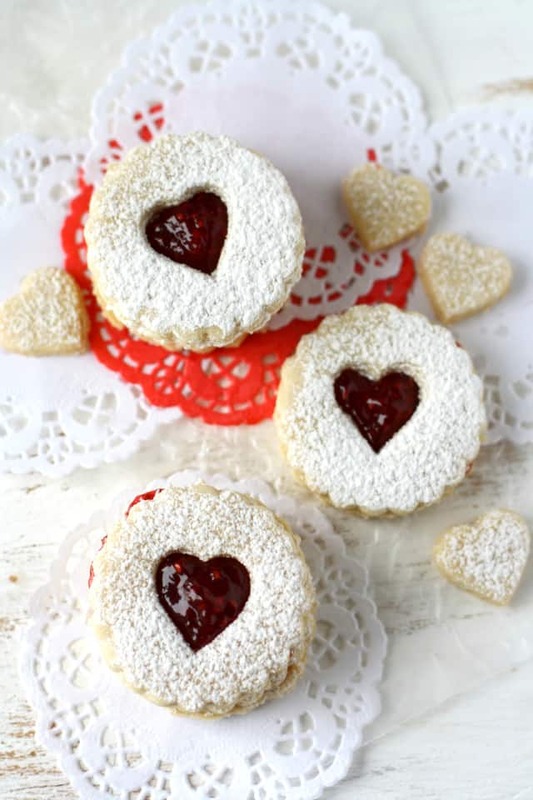 These pretty cookies are just perfect for Valentine’s Day or any day, really…they are buttery and delicious when filled with jam and dusted with powdered sugar. Not a jam fan? Melt some chocolate and use that instead! I used some Linzer cookie cutters I found online and I really like them. They’re easy to use, and the perfect size – not too large, not too small. If you don’t have Linzer cookie cutters, you could create the same effect with round cookie cutters and the round end of an apple corer. 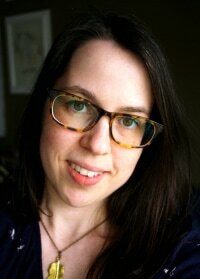 This post was originally published in February 2016. It has been updated with more tips. « Roasted Delicata Squash with Fresh Cranberries. Quick question….Do these cookies need xanthan gum? I noticed it is not included in your recipe instructions…. Also, if I am allergic to rice, and cant make your flour blend as is, can you recommend some substitutes for the rice flours that would still work out great…? I don’t know the weight, I’m sorry! No, if your blend doesn’t have xanthan gum, it will be fine. I don’t like using xanthan gum, and I never have any issues. Your cookies are so pretty! Happy Valentine’s Day!! Kelly these cookies are simply stunning! Love! How gorgeous are these cookies?? You totally nailed the WOW factor of these, Kelly! I need to try them! Your photos are just stunning! I am sure the taste matches it! These are absolutely gorgeous! What a sweet Valentines treat! Thank you, Kristine! I bet your kids would love the heart shaped pizzas! :) It’s a fun activity for them to help top them as well! Beautiful! I’ve never made my own Linzer cookies, but always love that jam filling!